Every Christmas, without fail, my brother and I would ask for remote control cars; every Christmas, without fail, we’d receive said cars and break them within a week. 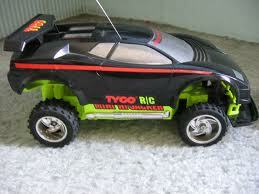 As the years progressed, my relatives began to catch on to the fact that $100+ RC cars were being totaled. I remember one year where we were told that we weren’t getting radio controlled anything due to them breaking each year (threats aside, we got them anyways). One year my Aunt presented me with two cars and asked me to decide upon one. Mine was a sweet yellow. I have no clue why I thought this car was cool. Must have had one heck of a commercial. I ended up deciding upon the Tyco Fast Traxx. My brother and I promptly took it outside and began putting it through its paces. Little known to me at the time, when the Fast Traxx’s treads grew warm, they would fall off. Eventually these rubber treads grew so worn (within a week or two) that they wouldn’t stay on the tire they attached to. Now we had a bike jump out on our back patio that my brother had built. So, we launched the car off of it. Ended up cracking the car where the back wheels attached to the body. You could literally see the gears inside the car moving. Not good. I guess what I am trying to say is that we killed the car, quickly. Another Christmas car destroyed. Mission accomplished, I guess…if that was the goal…which it wasn’t. We were just kids playing with toys. Dude, you just opened a vault I thought had disappeared in my memory. 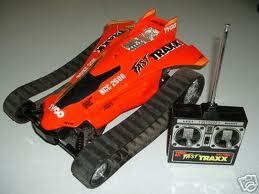 RC cars were such a huge part of my childhood, and I had almost completely forgotten about them. I kept it a long time, and I remember putting bugs in the little trunk area and driving them around. It was a pretty sweet car – my friend had “The Hornet” which was like a scale model of a dune buggy. It was much faster and bigger than mine, and I was always totally jealous. But the Hammer served me well for what it was worth. Dude, THE HAMMER looks super sweet. How long did it last? A GOOD long time. I don’t think it ever broke so much as I outgrew it. It was SO 80s! Pingback: Christmas Thoughts: Round 5 « JohnnyBGamer:. Do you still have the hi-jacker? Nope. Didn’t keep it. Chose the Fast Traxx over it. Hi I have a Hi jacker working and in good condition. Looking at selling it do you know what they are worth.